Dear Friends of Catholic Vitamins. 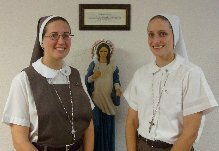 What great joy to introduce and share with you the SERVANTS OF THE PIERCED HEARTS OR JESUS AND MARY, also known and referred to Pierced Hearts Organization. One other thing: I was so surprised that the Servants have put together and are soon planning to hold their Second International Congress in Honor of The Hearts of Jesus and Mary. It will take place in Miami, and there is a very strong list of guest speakers. This congress will be held from 10/12 (Fri) afternoon till 10/14 (Sun). Golly I wish we could go. If you are interested, get the details from the website address above. At the beginning of 2012, Dee and DT had some discussions about our Catholic Vitamins Podcast and Blog. Part of our talks were about some marketing ideas, and part were oriented to show-content and approach. One of the things that came out of this was our ASK THE DEACON segment. Truthfully, we haven’t had a great deal of use from our listeners. But we have had some. Here is this week’s question for the Deacon. I would like to surprise my husband with a trip to Sicily and have his Uncle, who is a Deacon, to renew our wedding vows. I am not sure if he can actually renew them or does a priest need to and he can only stand by. It would mean so much to have him be able to, because he couldn’t make our first wedding in 1987. Hi Judy — greetings and graces. Congratulations on your anniversary renewal and travel plans. My wife and I went to Italy in 2004 and it was like traveling to the roots of our faith. It was awesome… but ours was more of a pilgrimage (Assisi, Rome, catacombs, etc.) while it sounds like yours may be more site seeing and enjoyment. At any rate, as a deacon I have definitely renewed wedding vows as well as marrying many couples. It is one of the faculties that we are given by the bishop of the diocese we serve in. That said, some pastors are sensitive to their role as shepherds of their parish. Some feel that these matters should be done by the pastor rather than a deacon. BUT… given that your uncle is a deacon – I just can’t see it being a problem. He (your uncle) needs to do a courtesy check-in/notice with the pastor. May Blessed Mother Mary who interceded for the couple at the Wedding at Cana be near to you and your husband in this special time.